What Is a Scribe Rail? 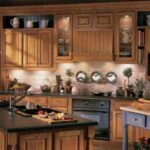 There are two types of cabinet construction: face frame and frameless (also called European-style). 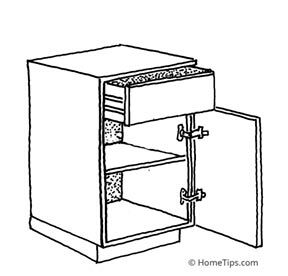 Face-frame cabinets, as their name implies, have a frame around the front of the cabinet. Frameless cabinets don’t. You can usually tell the difference between the two types of cabinet construction by the way the doors and drawers fit against the front. 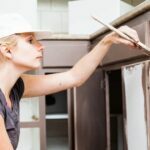 Another difference is that, because the face frame adds rigidity to the construction, face-frame cabinets usually don’t have a top panel or a full back (or the back may be made of thin material). Also, frameless base cabinets are usually mounted on top of a separate plinth or toe kick; face- frame cabinets have integral bases. 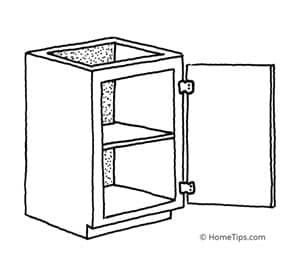 A face-frame cabinet has a 1-by-2 frame that rims the cabinet’s front edges, masking the construction and strengthening the box. 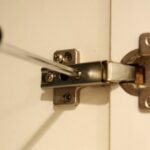 Doors or drawer fronts normally overlay the frame, but they may be flush or offset. Standard offset hinges are partially visible from the front. The frameless cabinet utilizes European-style connectors and hinges to create a contemporary look with flush doors and hidden hinges. 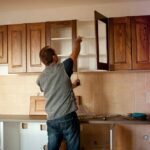 This method of construction is often used with laminate cabinets. Frameless cabinets usually have a solid top and back, and base units sit on a separate plinth. A scribe rail is a length of wood shaped to serve as a buffer between a wall with an irregular surface and a cabinet. To install one, use a simple compass to trace the wall’s surface onto the rail, and then trim it to ensure a tight fit.